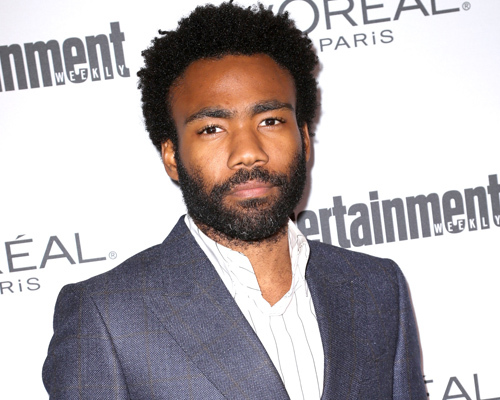 Donald Glover is ready to travel to a galaxy far, far away and to be in the new Star Wars movie and we can’t wait. On Friday, Lucasfilm announced that the 33-year-old actor is officially joining the cast for the upcoming Han Solo movie, which will be a stand alone film from the Star Wars franchise. According to Starwars.com the Atlanta actor will be playing the part of Lando Calrissian — the smooth-talking space smuggler — in the movie, which has yet to be formally named. "We're so lucky to have an artist as talented as Donald join us," directors Phil Lord and Christopher Miller said in a statement on Starwars.com. Glover is an absolutely spectacular addition to the cast and we have no doubt he’ll totally nail the role. The directors continued that he definitely has his work cut out for him as such an iconic character, but they know he’ll be amazing. "These are big shoes to fill, and an even bigger cape, and this one fits him perfectly, which will save us money on alterations. Also, we'd like to publicly apologize to Donald for ruining Comic-Con for him forever." Glover will be acting alongside Alden Ehrenreich who was previously announced as the film’s leading character, Han Solo. The film will show Lando’s life many years before The Empire Strikes Back and Return of the Jedi. According to the statement, the movie will show "Lando in his formative years as a scoundrel on the rise in the galaxy's underworld," which is going to be very interesting. We were just getting into Glover’s comedy genius on his FX series, Atlanta, which he created and stars in, but we’re willing to take a TV break to watch him back on the big screen making movie magic come 2018, when the future Star Wars film is set to hit theaters!